Hello from Egypt! How has your week been going? The last few days have been a bit of a whirlwind. I had hoped to post before now but it’s taken longer to go through photos than I had expected. I’ve been posting a bunch on Instagram, though…so be sure and follow there for daily updates. You’ll find BNOTP on Instagram here: BNOTP. 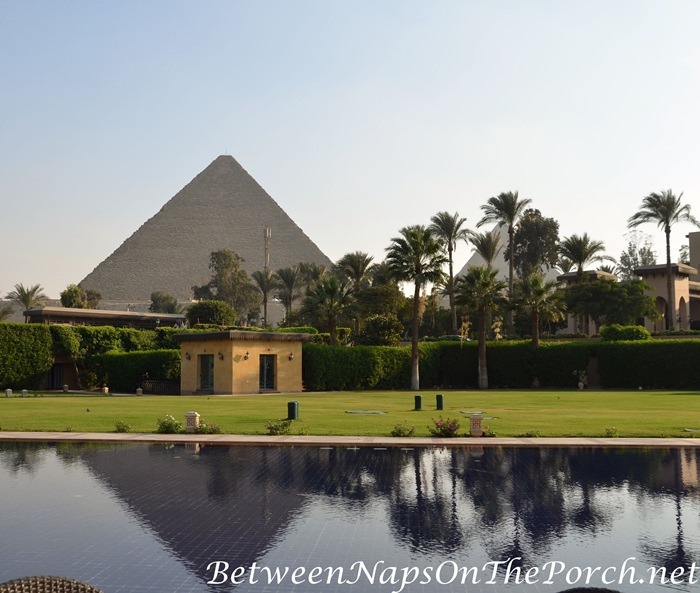 If you ever visit Egypt to see the pyramids, I can definitely recommend a stay at the Marriott Mena House Hotel. The design reminds me of the Fox Theater in Atlanta which was designed back in 1929 in an Egyptian theme. 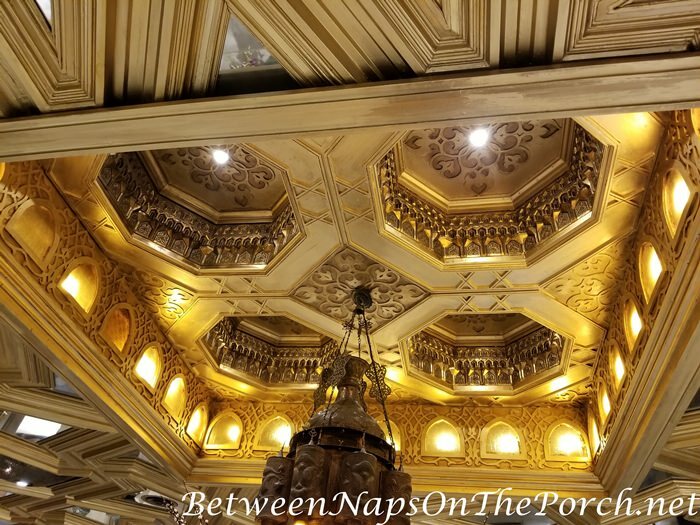 The lobby of the Marriott Mena is incredibly ornate. Wonder if this is how the Pharaohs lived back in the day, surrounded by lots of gold decor? 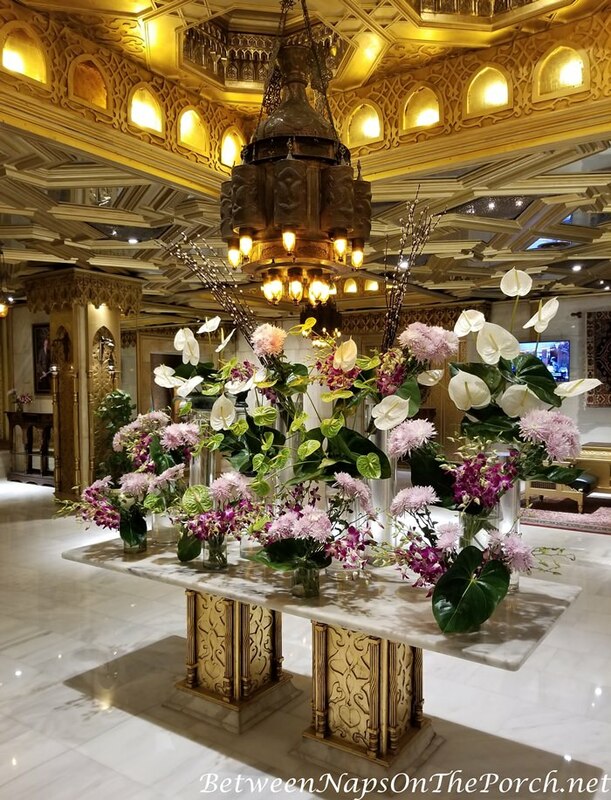 The floral arrangement in the lobby was really beautiful! My room was what they call a “pyramid view” room. It was already dark the night we arrived so I really couldn’t see anything that night. This was the view the next morning. Amazing how close the hotel is to the Giza Plateau where the pyramids are located. This is the view from the restaurant where we dined each day. So amazing looking out and seeing this view each day! See the little building in the photo? That’s the security/guardhouse where they scanned our bags each time we walked across the parking lot from the hotel to the restaurant. Each time we entered the hotel, our bags were scanned again. 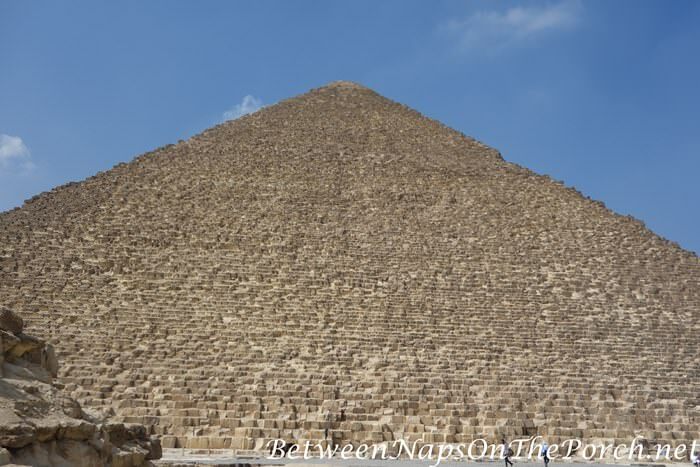 The Grand Pyramid of Giza, the pyramid of Pharaoh Khufu, is believed to have been built around 2560 BC. It’s the largest of the pyramids and was originally covered in limestone casing stone that created a smooth outer surface on the pyramid. Ever wonder how the pyramids look up close? 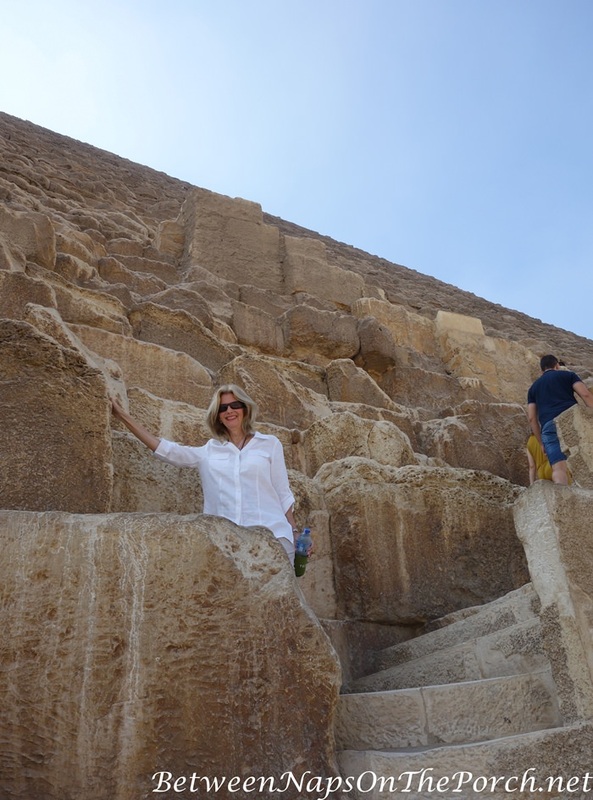 Here’s a photo of my friend, Teresa, standing on one of the lower staircase sections just below the Grand Pyramid. 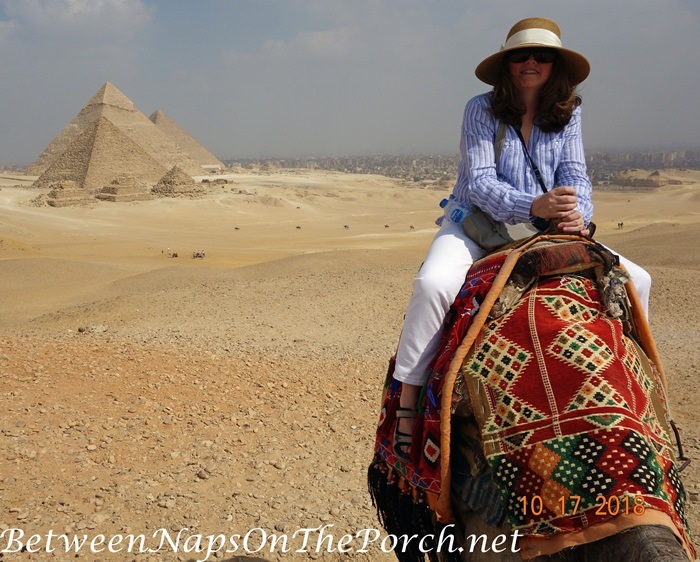 This photo was taken in front of the 2nd largest pyramid on the Giza complex, built for Pharoah Khafre who ruled during the 4th dynasty. He was the son of King Khufu for whom the largest temple was built. 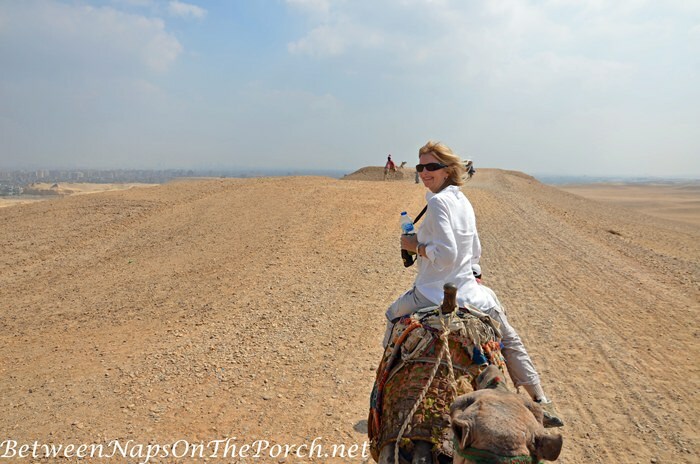 Teresa and I had so much fun riding camels with a guide out into the Sahara Desert. I brought along my Nikon D7000 with its kit lens (18-105mm) and it has been perfect for this trip. This is such a great time to go to Egypt. There are no insane crowds. The pyramid area is busy with visitors, but not overrun with people. We never felt crowded out or had to wait in lines to climb the lower areas where visitors are allowed to climb. The lack of huge crowds made for a very relaxing visit. I’ve ridden a camel once before in Morocco, but there was a nice little seat on the camel that time. This was a much bumpier ride and I was holding on tight, trying to make sure I didn’t fall off. Look at that view! Teresa snapped this photo of me…you can tell from my hair that we had a nice breeze that day. 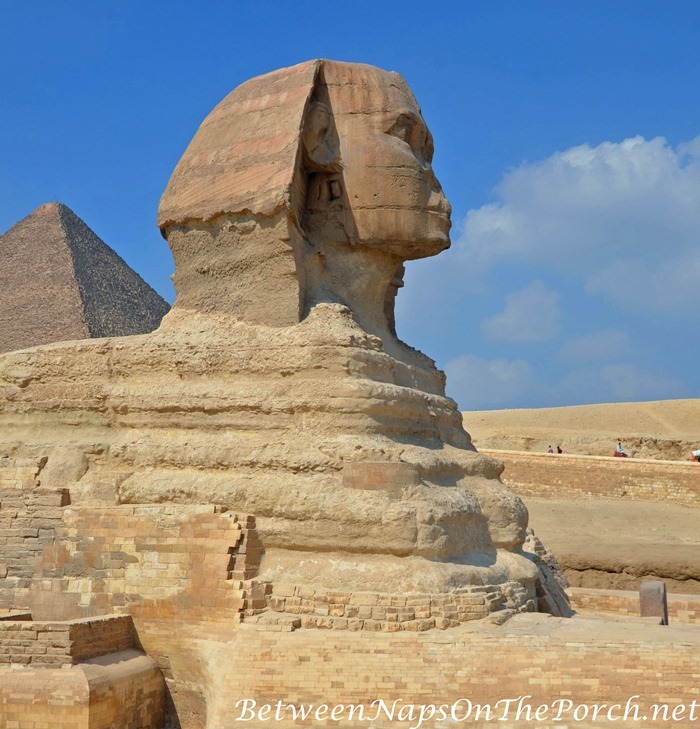 The Great Sphinx is located very close to the pyramids on the Giza Plateau. After seeing it all my life in books, it was surreal to finally see it in person! 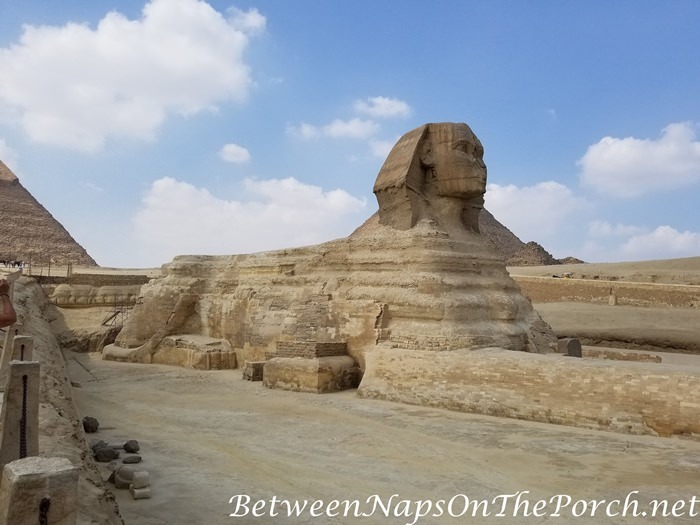 The Sphinx measures 240 feet long from paw to tail, is 66.31 feet high from the base to the top of the head and 62 feet wide at its rear haunches. The Sphinx is a limestone statue of a reclining sphinx, a mythical creature said to have the body of a lion and the head of a human. 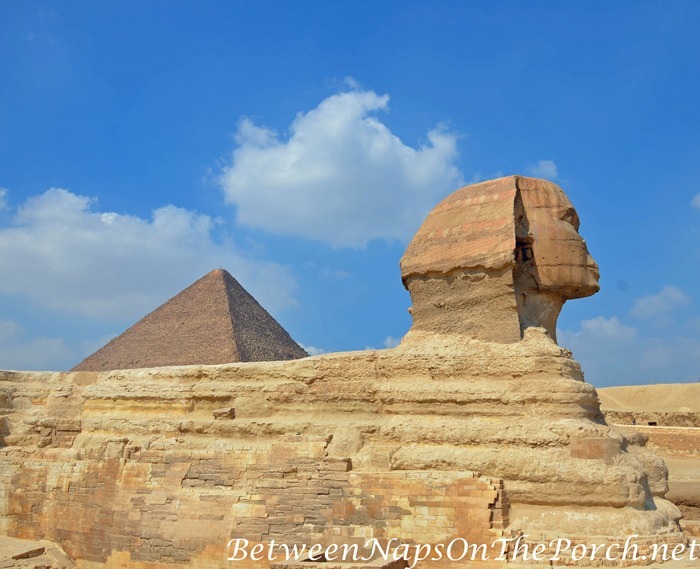 The Sphinx was built around 2500 C for the pharaoh Khafre, thus the face is thought to represent King Khafre. Truly amazing to see it in person! I’ll end this post with a sweet kitty. 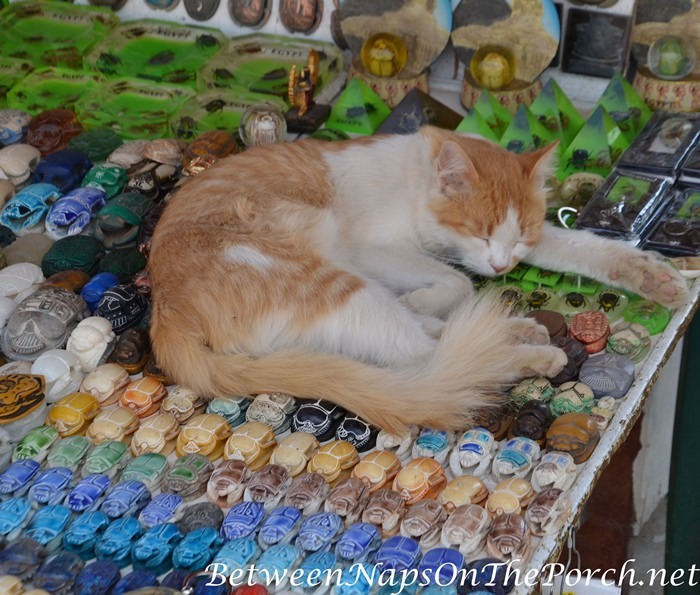 We found him snoozing away right on top of the souvenirs for sale in the market area just outside the pyramids. I’m looking forward to sharing more of Egypt with you real soon! I’m falling asleep as I type this so I had better stop and turn in. I think my body is still trying to adjust to the 6-hour time difference. Susan, what a fabulous trip to Egypt. The hotel looks beautiful. 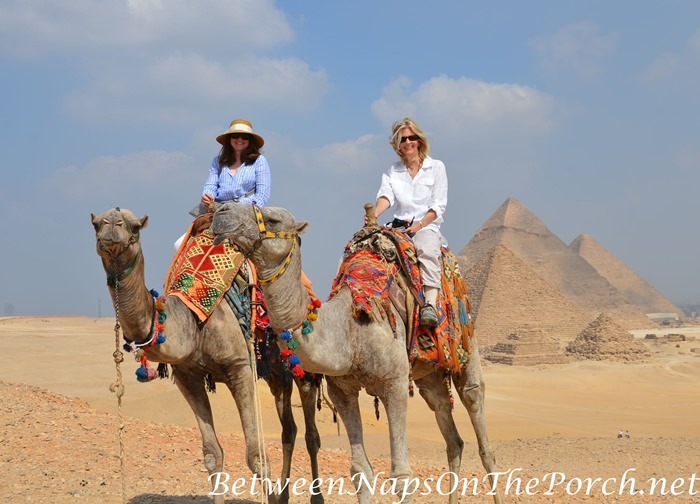 Your photos of the Pyramids and the Sphinx are amazing. I can wait to see more! It feels as if I’m there too with all these fabulous pics! Love the camels all dolled up. You and Teresa are beautiful women. So happy you are enjoying yourselves. And we can enjoy it all too! Thanks, Susan. Awww, thanks Dawne! Love sharing it with you! Looks like you’re having a wonderful time. Thank you for the lovely pictures. Safe travels. All looks wonderful, I love those vibrant colors covering the camel backs. I think it would be a treat to ride one. Amazing photos and great descriptions! Your enjoyment is coming through the cyber air waves. Thanks, Mia! 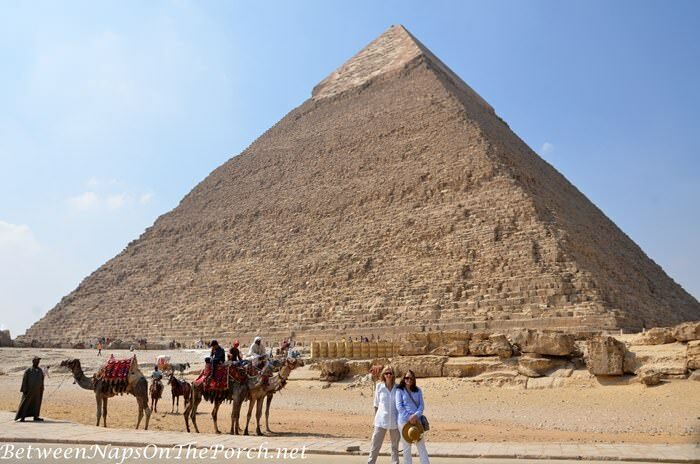 It’s an amazing experience seeing the pyramids in person…hard to describe. Oh, lucky you! So glad you’re enjoying yourself. I hope your friend liked the toothpaste. Is the food good? Doing any shopping? It really is amazing to be right by the iconic images only seen in books, television, etc. That’s how I felt on my first trip to London when the taxi drove by Buckingham Palace and never glanced over at it and I was gasping in the back seat like a total Rube. I will have to check out your Instagram. Hope Tegucigalpa camels didn’t spit at you! She did! She has purchased that brand before but had never tried the “Wonders of the World” collection so it was a hit. I’m headed over to the shops across the street from our hotel in just a little bit. One big disappointment to me is how many fakes I’ve seen here, even inside the hotels. There’s a whole shop/boutique in our hotel here in Hurghada (not the Marriott Mena back in Cairo) that is selling nothing but fake LV, Chanel, Dior, etc.. handbags and suitcases. I was shocked to see that in the hotel itself, especially since this is such a nice hotel/resort. I guess fakes aren’t frowned on here like they are in the U.S. Even the jewelry store in the hotel is selling fake Chanel, Cartier and Bvlgar jewelry. Love all of it but especially the kitty on the souvenirs! 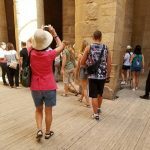 Susan, your photos and account of your visit makes me want to book a trip to Egypt, and honestly, it has never been on my radar. Glad you are having a grand time. Thanks, Sarah! It’s been amazing so far. No big crowds and everyone has been sooo nice! We haven’t had to deal with that many people harassing us to buy things, they pretty much leave you alone with you say, No thanks. Oh my goodness…your photos are so pretty. Gorgeous blue sky and I know you are enjoying it all. I am so happy you are having this experience of a lifetime. I am enjoying your posts and Instagram too. Nite nite. The weather has been perfect! Not overly hot, very similar to our October weather in Georgia. Thanks, Donna! Thanks, Bren! Appreciate that so much! 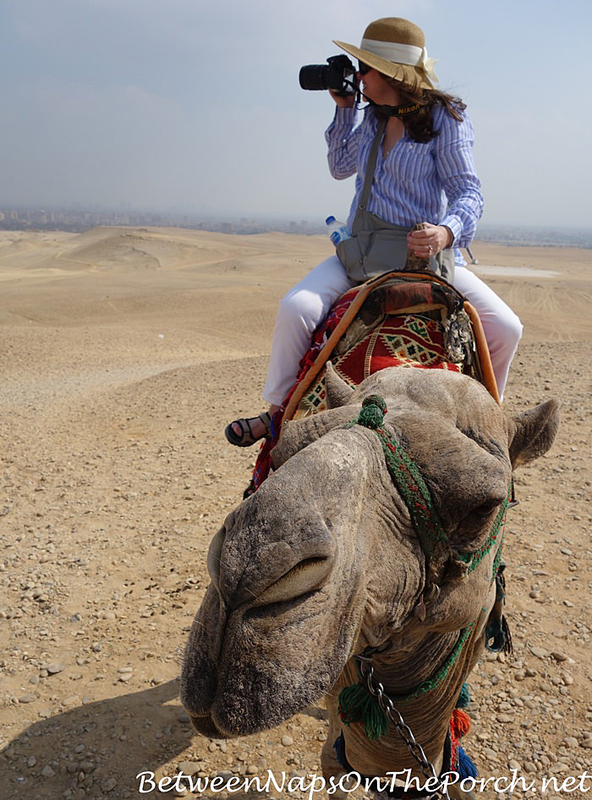 Susan, you look a natural on a camel, but then with all the camel riding you’ve done…. I’m glad you took this trip, and wow the hotel lobby is fabulous. Looking forward to more photos and musings about this adventure of yours. You certainly are not a shrinking violet. All the stores in Buckhead are closed, waiting to open up when you return. Looks like a fabulous adventure. Looking forward to more photos. Looks like you are having an amazing time! Safe travels! Amazing trip!! Have fun, Susan. Kitty liked sleeping on the scarab beetles … thought to be lucky. The ancient Egyptians believed the scarab beetle pushed the sun across the sky. Can’t wait for more pictures! Amazing photos! I had no idea the Pyramids were so rough and Rocky. Looks like beautiful weather! Enjoy your trip! Amazing pictures! The hotel & your view are gorgeous! The pyramids are something my son has said, since he was a young child, that he wanted to see. I will be sharing your posts with him. Thanks for taking us along on your fantastic trip! I’m excited to see more pictures! Oh, Wow!!! And the river Nile is right there…..duh…. Enjoy!! Unbelievably gorgeous photos! Thanks so much for sharing them with us! So cool to see all that! Love the blankets on the camels, so colorful! Another great adventure, and it looks fabulous. So do you! Wow how fantastic. I love how the camels are adorned with the colorful tapestries. I think that camel wanted his nose scratched or a treat! You both look truly happy! What great pictures. Love seeing the pyramids up close. The hotel is gorgeous. You must be pinching yourself to see if it’s all real! 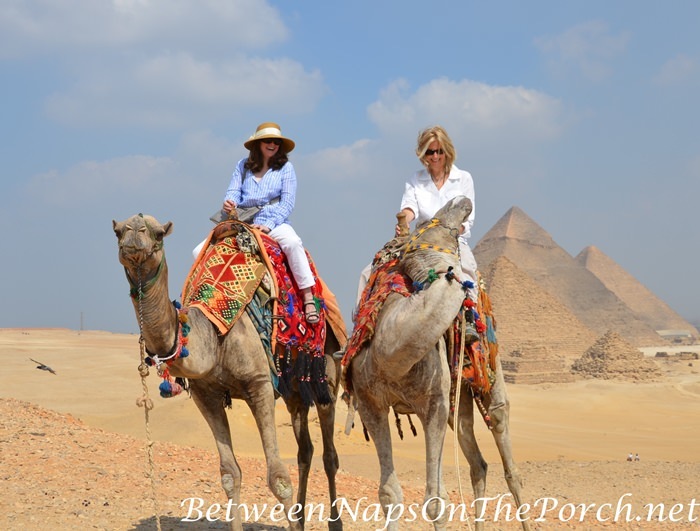 It has been quite a few years since we visited the Pyramids and stayed at the Mena House. The Mena house was also known for a famous Belly Dancer. It was said that she was the Best of them all. Your photos are amazing. I’m sure you had a wonderful time. You are so fortunate to be able to travel as you do and those of us who aren’t so fortunate, appreciate seeing the world vicariously through you. Also, your pic of the kitty napping on the souvenir table reminded me once again that regardless of location … cats rule the world. I saw a photo once of a red carpet that was formally laid out for a visiting dignitary in some foreign country and while hosts and photographers were waiting for him to arrive, a cat very casually found its spot right in the middle of the carpet and proceeded to carefully bathe itself then take a nap. Susan, I’m so impressed with you traveling all over the world like you do! I love seeing your pictures. When I was in 6th grade I had a teacher who was just fascinated by Egypt and we spent the year studying all about it between other mandatory subjects. I’m excited to see more pictures of your latest adventure! Been following your adventure. 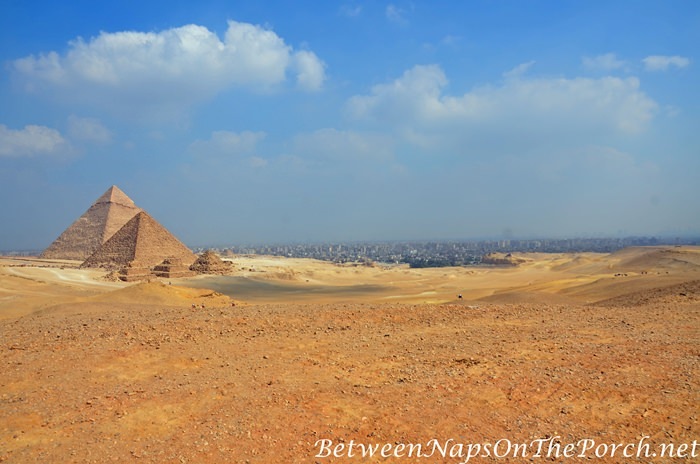 How far away are the pyramids from your hotel and/or the city? I saw a photo one time that looked sort of like a strip mall/shops was quite close but it couldn’t have been the perspective. Do they state the purses are fake or can you tell by price and how they look? Have fun! Sandy, sorry I missed your question back when I was traveling. 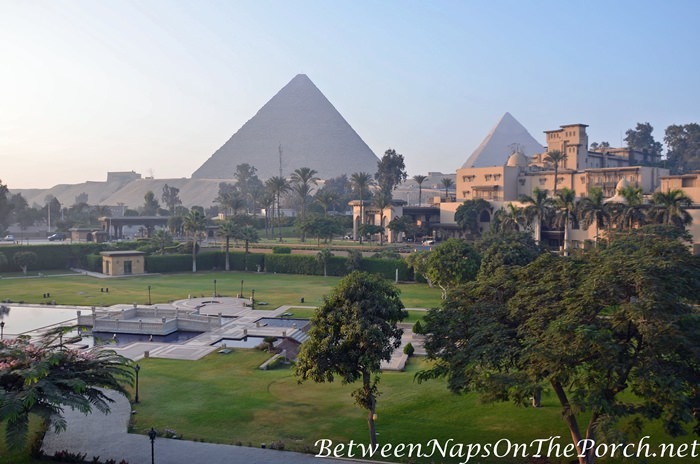 The pyramids are within walking distance of the Marriott Mena House hotel where we were staying. I think it’s about a 20-minute walk from what I heard, though our guides drove us there the day we visited. So they are very close to the city of Cairo. Susan, thank you for sharing, your photos are just wonderful! Continue to have a GREAT time visiting Egypt. God bless and safe travels. Wow! What a trip of a lifetime! The pictures are all so amazing! I feel as if I’m right there, too! What a wonderful memory of your relatives. The dragons pouring tea sounds very Game of Thrones-ish and something I would really enjoy too. I rarely buy big souvenirs when I travel. On this trip to Egypt, I purchased a fun papyrus that glows in the dark. It was rolled up but still a pain to keep track of along all the stops. Like you, I hope my stuff goes to my family members who really want the items and not a giant estate sale. I’m glad you’re having a good time! 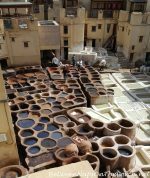 Looking forward to more posts from Egypt!